AFIFA International Presents This Exclusive Combo Set. This Combo Is An Ideal Option For Personal Gifting, Corporate Gifting, Employee Gifting, Exhibition Purpose, Diwali Gifting, Gifting For Rewards And Recognition Etc. Beautifully Packaged In WildHorn Gift Box, These Gift Boxes Are The Perfect Gift For Any Occasion. The Items Are Constructed Of Natural Full Grain Genuine Leather With Stylish Stitching And An Embossed Brand Logo. 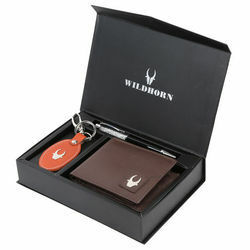 This Wildhorn Combo Gift set comes with an elegant neck tie and a wallet. Made of Exclusive High Quality Genuine Leather, Well Designed By Skilled Handcraft Man, Durable Cloth Lining. This WildHorn Gift set Combo with Wallet & neck tie. This combo set has been made out of Top Grain Leather and its a natural thing where colour variation is never under control. Pure leather wallets get more beautiful on ageing. These are not PU which will contain shine on its surface. 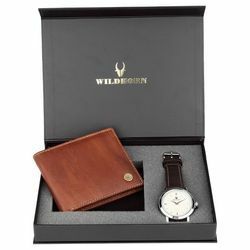 ★★★★★This Wildhorn Combo Gift set comes with an elegant Watch and a wallet Made of Exclusive High Quality Genuine Leather, Well Designed By Skilled Handcraft Man, Durable Cloth Lining. ★★★★★ GIFTING HAPPINESS: GIFT BOXED: It will be presented in an appealing gift box, making it as a ideal gift. Gifting is known to be one of the five languages of love. There is no individual in this world who does not feel the love and affection of the sender when they receive a gift. ★★★★★ PREMIUM FUNCTIONALITY: Men's classic wallet with 8 card slots, 2 hidden card slot, 1 leather framed ID window and 2 Note compartment. Extra capacity leather slim fold wallets and perfect front pocket wallets.Top quality and luxury slim wallets! 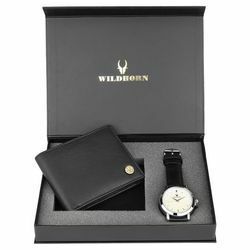 This Wildhorn Combo Gift set comes with an elegant Watch and a wallet Made of Exclusive High Quality Genuine Leather, Well Designed By Skilled Handcraft Man, Durable Cloth Lining. ★★★★★This Wildhorn Combo Gift set comes with an elegant formal belt and a wallet. Made of Exclusive High Quality Genuine Leather, Well Designed By Skilled Handcraft Man, Durable Cloth Lining. Belt is a free size that can be adjusted as per waist size. · ★★★★★Ideal for Men & Boys. The belts is Free size with design Buckle. Made in Real Leather, Suitable for Formals. · ★★★★★This combo set has been made out of Top Grain Leather and its a natural thing where color variation is never under control. Pure leather belts or wallets get more beautiful on ageing. These are not PU which will contain shine on its surface. · ★★★★★We at WildHorn are working hard to make and present the best product made up of Pure Leather. We are looking to have good and genuine feedback that might help others.